Welcome to my horrific, Kafkaesque nightmare. Upon arriving in the town of Beaton, only a few dollars to my name, I was offered a job moving boxes from a conveyor belt to the back of the van. The supervisor, a burly fellow named Red, said if I could clear out the inventory he'd recommend me for further work in the future. But there's no end in sight. I've moved 96 boxes to the back of this van, according to the sign on the wall. The game gave me the option to quit after the first box, but I'm determined. I walk mindlessly back to the conveyor belt, grab another box, make the long trudge back to the van. 97. 98. 99. 100. Wait a second. The counter on the wall refuses to roll over again. It's stuck on 99. I move Box 101. Nothing. The sign still says 99. I move box 102. The sign mocks me. That's it. I'm done. I walk over to the supervisor. "I didn't figure you for a quitter," he says. He's right. I move another twenty boxes, hoping that it's a trick on the part of the game designers. Maybe there's really an end. There isn't. I just spent half an hour moving fake boxes across a fake warehouse, loading this precious digital cargo into a fake van. This, ladies and gentlemen, is Always Sometimes Monsters. Kierkegaard. Sartre. Camus. These are names I never thought I'd reference in regards to a review, and yet here we are. First, let's get this out of the way: Always Sometimes Monsters is not necessarily a fun game, nor is it necessarily a game you need to play. I didn't enjoy its meta-commentary nearly as much as, say, The Stanley Parable, and a lot of the game is flat-out boring—sometimes seemingly by design, other times not so much. 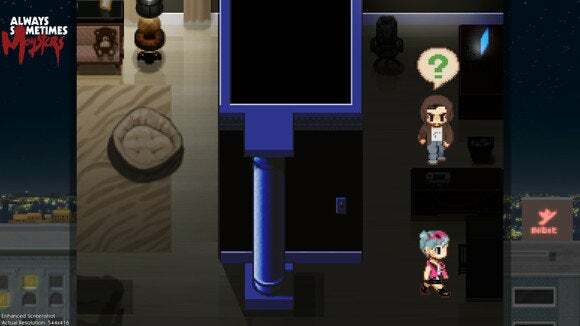 Many of the problems are a direct result of the limitations of RPG Maker, the development-in-a-box tool used to make the game—slow dialogue prompts, awkward tile layouts, generic-looking characters, and tedious mini-games all rear their heads here. Another big problem is that the first half of the game is loaded up with content, while the second half feels comparatively brief and sparse. But in Always Sometimes Monsters we get what is essentially an existentialist text in game form. Do choices matter? Can life have a meaning? Is there such a thing as fate? These are some heavy questions for a game, and while the writing is not always deft enough to hold all the weight here, it's an admirable attempt. "I want to tell you a story. One about the choices we all make," a character says early in the game. Choice is the framework here. In fact, I once made a decision that led me to an ending two minutes into the game. It wasn't a very satisfying ending, but it was still a valid ending. Make it past that first choice and things broaden even more. By way of a bit of misdirection, you'll choose your main character at the beginning of the game from a group of party attendees. Immediately after, you'll choose your character's significant other. You're on the verge of signing a big-time contract with a publisher—cause for celebration! Flash forward a year and you're penniless, living alone in a dump known as Dubstown. Why? What happened to your fiance(e)? Your book? Everything was going so well, and now your landlord is threatening to throw you out on the street. Where did the year go? You'll learn these answers early on, and then it's up to you to make it from Dubstown across the country to San Verdano in thirty days. At least, I think that's the point of the game. I assume you could also reach a perfectly valid ending by never leaving Dubstown. It's not like the game is forcing you to go. Nor is it making it easy for you to leave. You're broke, sleeping on the curb. Your friend, a recovering heroin addict, is having problems of his own. Basically everything you know is in chaos. It's easy to make the wrong decisions. It's easy to lose all sense of morality. My friend, the recovering heroin addict? His girlfriend ends up in the hospital after overdosing. She and I never really saw eye-to-eye—she kept trying to get him back on the heroin train, while I was desperately trying to keep him clean. It's killing him though. He can't let her die, and the doctor is refusing to treat her. Do I up and leave town, deciding not to get involved? Do I break into the doctor's house and find materials to blackmail him with? Do I smash up his car? It's my friend. I can't just leave him. That's how I find myself breaking into a mansion in broad daylight, snooping through his computer for compromising pictures. It feels wrong. It feels dirty. And it feels even worse because I chose to do it. She gets her treatment, though. She lives. What's the greater evil, here? Always Sometimes Monsters doesn't pass judgment. Characters might pass judgment, but other characters support you as a hero. You saved her. It's uncomfortable, and ultimately falls to you to extract some sort of meaning from your choices. This game isn't nearly as fun nor as polished as, say, Papers Please or The Witcher 2, but the same sort of moral relativity bleeds from this game. You're never really sure whether you're making the right choice or the wrong one. A lot of times there is no right or wrong choice. I think there must be some sort of "optimal" ending, but you wouldn't necessarily get there by making better choices—just different. Again, I don't think Always Sometimes Monsters is a great game. It has a lot of problems. There are times when it's extremely unclear what you should do next or where you should go. A lot of the "missions" are bland and tedious by design, but that doesn't necessarily sit well when you still have to play those sections. 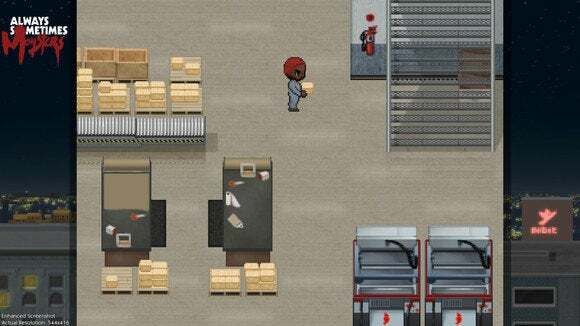 No matter how boring factory work is in real life, it's not easy to recommend a game that faithfully adapts that boredom into a game mechanic. In many ways it's a less-polished version of Cart Life—a similarly tedious, but no less striking, game. Always Sometimes Monsters is an experience, though—one that blends a lot of the bureaucratic tedium of a Kafka novel with the core tenets of existentialism. The writing buckles under its own weight and the game itself buckles under the RPG Maker albatross, but damn is it ambitious. 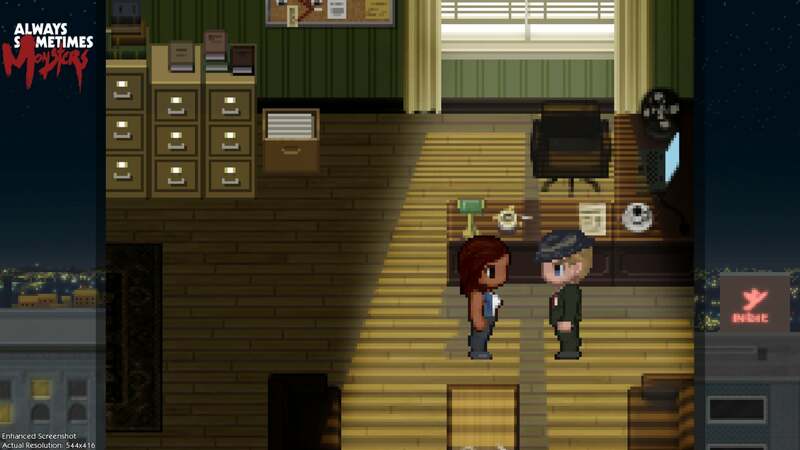 Always Sometimes Monsters is an interesting experiment, but ultimately buckles under the weight of its own ambitions.